Sorry, we're closed. Schedule online anytime! Come celebrate May Day and kick off the May membership drive for the People’s Organization of Community Acupuncture (POCA) with a FREE acupuncture treatment on Wednesday, May 1, from 2:00-6:00pm. Our May Day Free Day event is on our website (click here) and also on facebook (click here). Also known as International Workers Day, May Day is acknowledged worldwide as a commemoration of the social and economic achievements of the international labor movement. 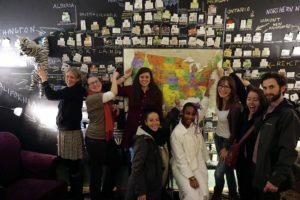 POCA Community Acupuncture clinics like Boston Acupuncture Project are social businesses dedicated to affordable healthcare. 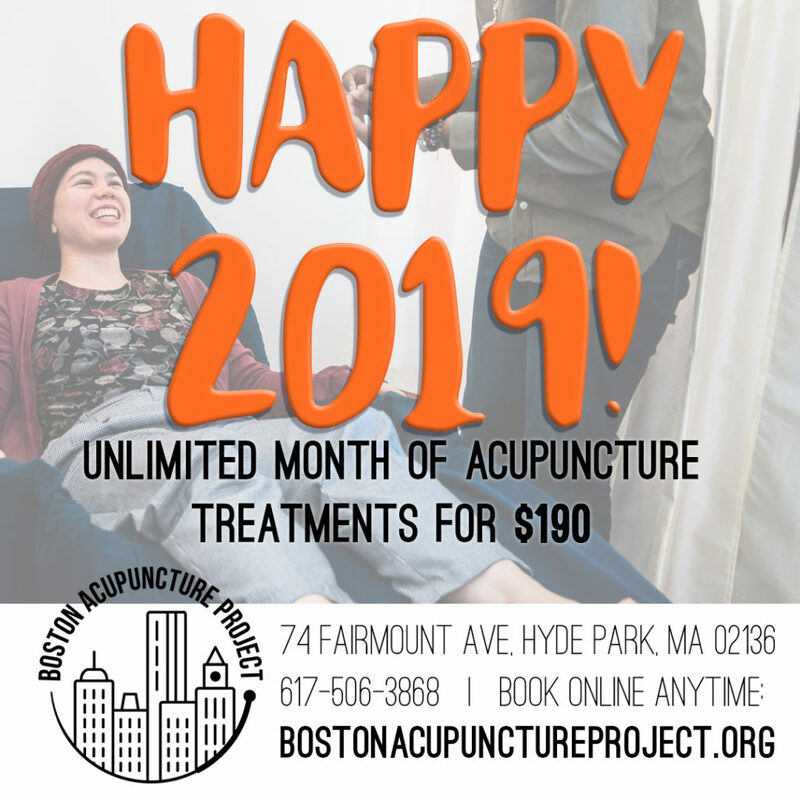 Whether or not you have ever been to Boston Acupuncture Project, you can click here to reserve your May Day free treatment online or walk in from 2:00-6:00pm on Wednesday, May 1st, at 74 Fairmount Ave, Hyde Park, MA 02136. Walk-ins are always welcome as long as there is space – just wait for someone to greet you before going in past the waiting area. You will also have the opportunity to sign up for a POCA membership – or just click here to sign up online now! 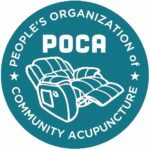 The People’s Organization of Community Acupuncture (POCA) is a multi-stakeholder cooperative working to make acupuncture available to as many people as possible. POCA members are acupuncturists, clinics, and – the largest membership group – patients/community members! POCA members believe everybody should have access to the many benefits of community acupuncture. For that to happen, we need more acuPUNCturists (a.k.a. ‘punks’) in more places! That means a community acupuncture clinic in every town, everywhere. POCA works toward this goal by funding micro-loans for new clinics, running a fantastic, affordable community acupuncture school called POCA Tech, and supporting volunteers in many other projects promoting access to affordable group acupuncture. Boston Acupuncture Project, a clinic member of POCA, regularly provides acupuncture treatment for everybody on a sliding scale of $20-$40. With over 150 Community Acupuncture clinics across North America, thousands of individuals are expected to receive free services on May 1st. 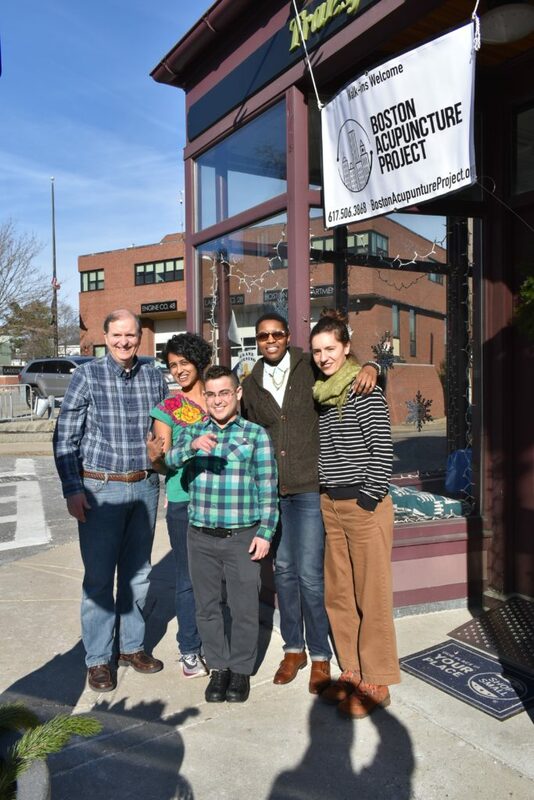 In May, Boston Acupuncture Project participates in POCA’s Membership Drive. We wish everybody, everywhere who had an ache or a pain had a local acupuncture clinic to turn to, so we’re making that happen – and you can join us. This year’s theme is “More Punks in More Places”. A POCA membership is an opportunity for you to help others receive care, while also benefiting yourself. By paying once-a-year dues on a sliding scale from $25-$100, you directly support the creation of new community acupuncture clinics, and the graduation of more acu-punks from POCA Tech, so more people can get more acupuncture. A POCA membership can pay for itself in a few treatments, because perks include a free treatment on your birthday, 3 “free first treatment” coupons to share with loved ones, and having all new patient paperwork fees waived at any POCA Clinic (click for a map)! Our new patient paperwork fee of $10 is always waived for all POCA members, but in May 2019, POCA members get 25% off all month long. That means you can pay just $15 for any acupuncture visit when you show your POCA membership card. As POCA members we are creating jobs, creating community, and creating a healthier future for everyone. We hope you will join us. If you have any questions please check out POCA’s mission and vision at https://www.pocacoop.com/our-mission-and-vision, or ask your acupuncturist how much POCA means to them! Have you had a good experience at Boston Acupuncture Project? Would you like to help more people find out about Boston Acupuncture Project, and the benefits of acupuncture? One of the best ways to spread the word – and help us out – is to review BAP online! 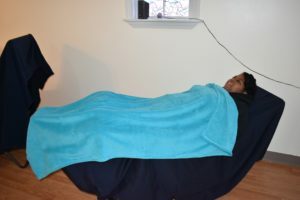 What got you to try acupuncture at Boston Acupuncture Project? How did you feel when you started coming to acupuncture? How did you feel after getting a few treatments? What was the main benefit you experienced from getting acupuncture at Boston Acupuncture Project? Who do you think should come here to get acupuncture? What would you say to someone who is hesitating about coming to Boston Acupuncture Project? For example, you might name an activity that you stopped doing but could start again after getting acupuncture, like a hobby. You can also talk about more basic things that acupuncture helps you with, like taking a walk without pain, or sleeping through the night. Thanks for reading and thinking about writing a good review! Often acupuncture works best when you get a lot of treatments in a short period of time. Usually we recommend the minimum number of treatments that we think you will need, based on clinical experience – but sometimes even that amount of treatments seems like a LOT. For example, quitting smoking – a popular new year’s resolution – often works best with acupuncture when you can come in several times every week for a few weeks! So, in order to help support your new year’s resolutions, we’re offering a special all month of Unlimited Acupuncture Treatments. This package is good for 30 days from the date of purchase. Feel free to ask after your first treatment if this option could be right for you. Fine print is below! Also check out Newbie Tuesdays – click here for more details! Brand new visitors get a free first treatment on Tuesday mornings at Boston Acupuncture Project, 9:00am-1:00pm, every Tuesday in January 2019. You can make an appointment online by clicking here. Tell your friends, loved ones, anyone you know who might be able to use these specials! Best wishes for a healthy, happy new year. Available in the clinic – please sign for and purchase in person. – this special may not be combined with any other offer or promotion. Yes, we get the message – you want to give your loved ones the gift of an acupuncture treatment! We now have gift certificates available for easy purchase online. 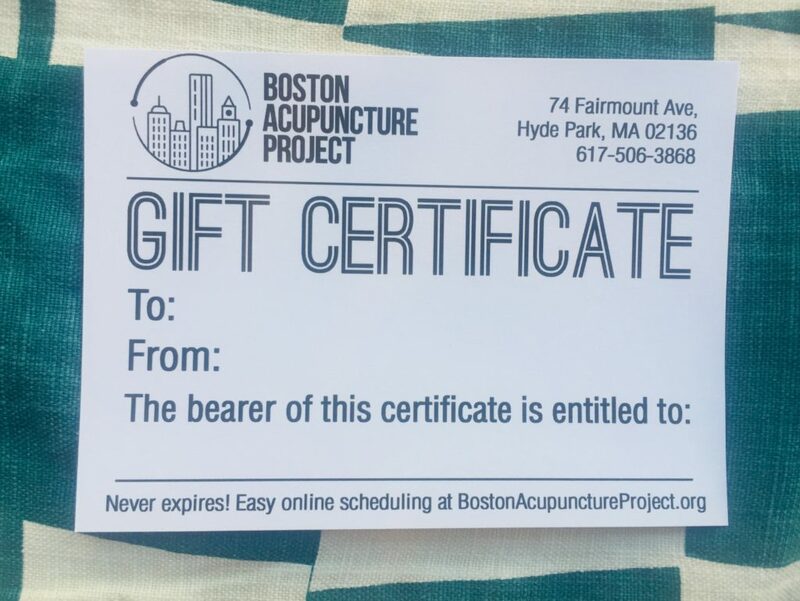 Anything you see in the Boston Acupuncture Project online store that says Gift, and any Special Offer Package, will have a gift certificate you can print out. You can also scroll down here to see our special packages. If you need us to give you a physical gift certificate, just stop by when we’re open. This week, we are here Thursday, Dec. 20, 9:00am-2:00pm and Saturday, Dec. 22, 10:00am-3:00pm. Happy holidays! This year, on International Human Rights Day, POCA clinics across North America are fundraising for local groups fighting for human rights in a variety of different ways. City Life/Vida Urbana is a grassroots community organization committed to fighting for racial, social, and economic justice and gender equality by building working class power through direct action, coalition building, education and advocacy. 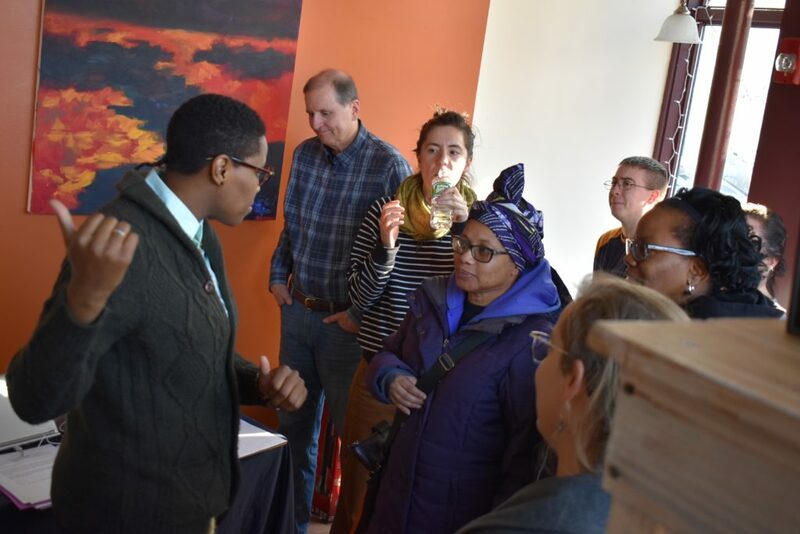 Through organizing poor and working class people of diverse races and nationalities, City Life/Vida Urbana promotes individual empowerment, develops community leaders, and builds collective power to effect systemic change and transform society. Support housing justice while getting acupuncture by coming in on Monday, December 10. We encourage appointments, but walk-ins are very welcome, schedule permitting. Book online at http://bostonacupunctureproject.org/schedule/ or call us to claim your spot! 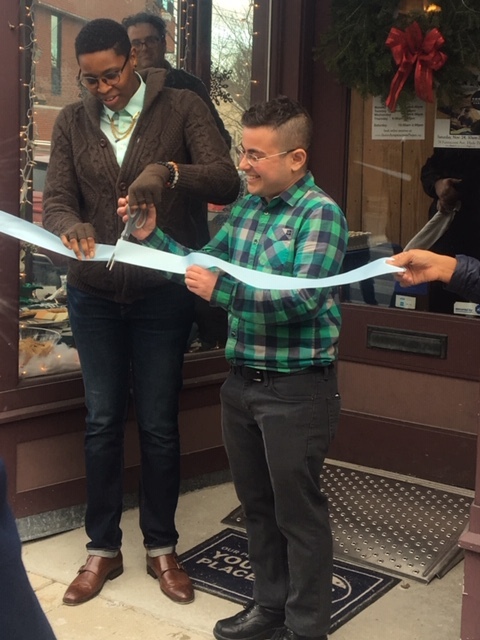 Hyde Park warmly welcomed Boston Acupuncture Project to 74 Fairmount Avenue with a bustling Grand Opening Free Day on Small Business Saturday, November 24, 2018. Neighbors, friends, and family enjoyed snacks, socializing, and tours of the space in addition to free sample acupuncture treatments. Directors Shoba Narayana and Angie Wolfrum greeted visitors and organized the waiting list while Director LaTeisha “Tj” Johnson – expecting her Masters in Acupuncture degree in May of 2019 – helped pull needles from guests after their free treatments. 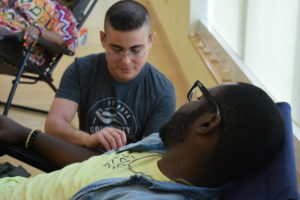 Licensed acupuncturists Oren “Ren” Pilinger (executive director of Boston Acupuncture Project) and Steve Kingsbury (Board of Directors chair) gave 39 free sample acupuncture treatments in just under 4 hours. When it came time to cut the cake, organizers realized there was no knife. Mrs. Pilinger, visiting from Florida on the occasion of the Grand Opening, went across the street and asked for a knife from Fairmount Grille. 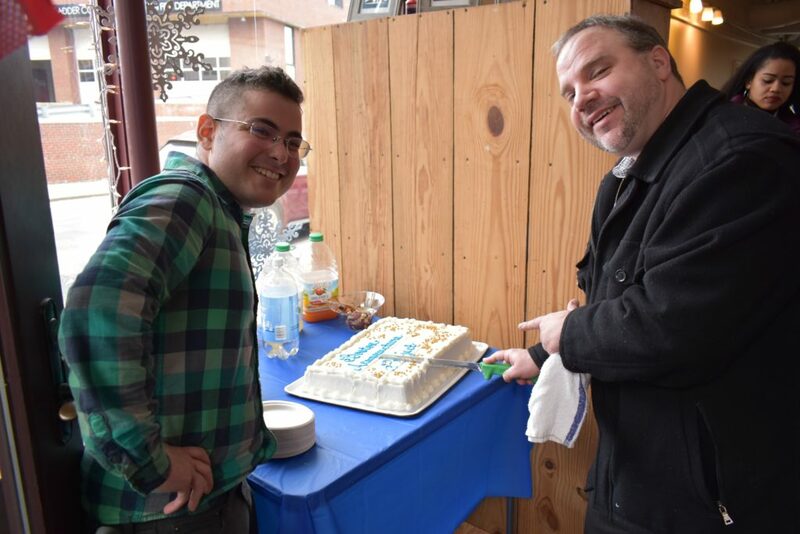 Owner Christopher Rassias lent a knife along with his skills and expertise to cut the cake. Bring your friends, family, neighbors, everybody! Free sample acupuncture treatments available from 10:30am-1:30pm, first come, first served. We will have a ribbon cutting ceremony at 2:00pm. Refreshment details TBD! But we will have food! Special treatment packages will be for sale. Don’t miss this! 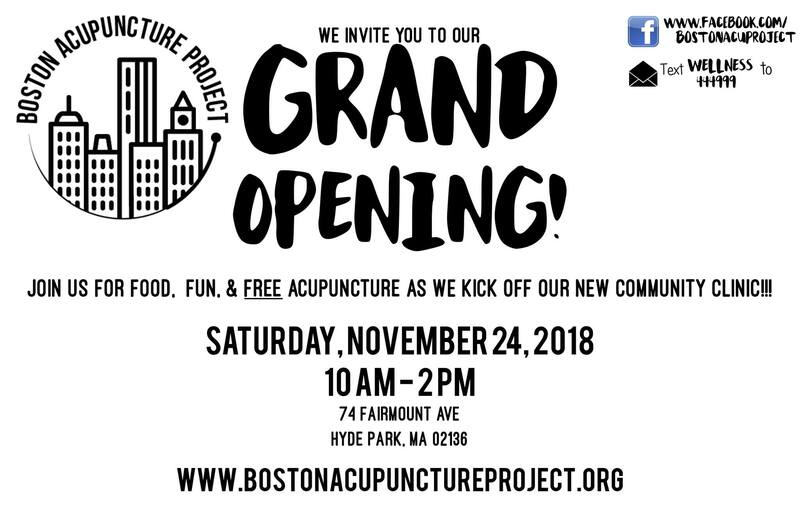 The Boston Acupuncture Project is seriously looking for a space in which to open! This could be commercial space for lease, including a retail storefront, or a space within another organization that we could sublet long-term. We have been working with excellent brokers, but are hoping for a non-traditional solution or partnership. Space needs: one large room that can be blocked off from the outside, just so you won’t see everyone in it immediately after walking in – sort of like a yoga studio – but that can be dedicated to being a community acupuncture clinic 90-100% of the time! If you know of a space that fits our needs, please email us! Free treatments for all on Wednesday, May 1, 2019 from 2-6pm. Join POCA and get 25% off all month. What’s POCA? Our acupuncture co-op! And you can join! UPDATE April 21, 2019: congrats to UCFW workers on a tentative contract agreement with Stop & Shop! Our offer (details below) is extended one week, through April 28, 2019.